EMC Seafood: Click here for all the details! Left Bank Brasserie: Every Day in the Lounge and Patio from 3-6:30 PM and 9 PM- Close, Click here for full menu. LB Steak: All Day Sunday and Monday; 4 -6 PM Tuesday-Friday; offered at the Bar and on the Patio. 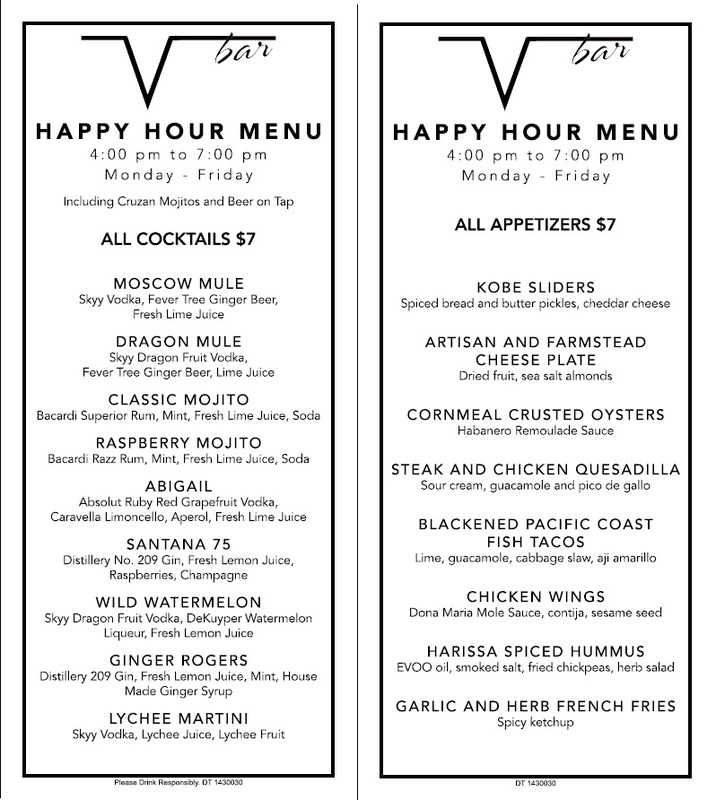 Click here for full Happy Hour Menu. Ozumo: 3:30-6pm, click here for full menu. Rosie McCann’s Irish Pub & Restaurant: Every day from 3pm-6:30pm half off all appetizers and $2 off beer and cocktails. Strait's: Monday through Friday from 3pm-6pm Bar and lounge area only. Click here to see a full list of details. Tacolicious: Catch Happy hour from 3pm-6pm Mon-Fri and 9:30pm-Close 7 days a week! Closing time is at 11pm Sun-Wed and at 12am Thurs-Sat. V-Bar: Mon-Fri from 4pm to 7pm, Click here for the Happy Hour Menu, or for the entire full menu click here. Yard House: Click here for a full listing of the Happy Hour Specials!